I was never really big on stereoscopic 3D. 3D movies just didn’t do anything for me, probably because when I ran into one it usually meant a bunch of cheesy gimmicks tossed in to take advantage of 3D viewing rather than a solid film experience. 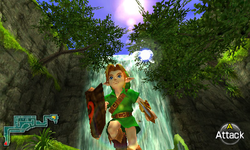 Even though I was pretty darn impressed with the way 3D was implemented in Pilotwings Resort thanks to the 3DS’s use of pop-in 3D as opposed to the simple pop-out features I was used to, I still maintained a healthy amount of skepticism about how 3D could be incorporated into Ocarina of Time 3D – a game that wasn’t designed with it in the first place. Then I got a chance to experience the game in 3D at E3, and my tune totally changed. Everything has been taken into account when rebuilding the game for the 3D effect – and I mean absolutely everything, from characters to landscape features to enemy attacks. See a platform that you need to jump to? Well, now you’ll be able to see just how much you close the distance as you prepare to make a running leap towards it. See an enemy coming towards you? The intensity’s gone up a notch – now they look almost as if they could walk right out of the screen! It’s still the same game, but the 3D effect really does make everything in it seem more genuine. This doesn’t really have a huge impact on the gameplay side of things, but the 3D effect plus the overhauled graphics really does make the game a completely new experience visually. Approaching the Great Deku Tree in 3D gave me the impression that he was looming over me – something I remember feeling the first time I played the N64 version but that was all but forgotten in subsequent play-throughs. I noticed a lot of things as I was wandering around in the demo that were surprisingly just plain neat to look at – which is saying a lot for a 13-year-old game, even given a graphical update. Just to make sure this wasn’t just a fluke, I downloaded the Ocarina of Time 3D trailer on my brand-new 3DS (which coincidentally is also based on a 13-year-old commercial), and I was blown away all over again. In less than two days I’ll finally get to fully explore Hyrule in 3D, and – I can’t believe I’m saying this – I’m actually really excited to see what new experiences 3D will offer this classic Zelda legend. I know Nate had similar feelings – if you’ve read his impressions, you know that he agrees that 3D is definitely the preferred way to play – but we’ll see if he’s still singing the same tune when he releases his full review of the game soon. For those of you who already have the game, what do you think of the 3D effect? Is it something to get hyped about, even a little? Did it disappoint you? Or is it just a nice addition that doesn’t help or hurt the game? Let us know in the comments – and check out our Ocarina of Time 3D walkthrough for all your game help needs!